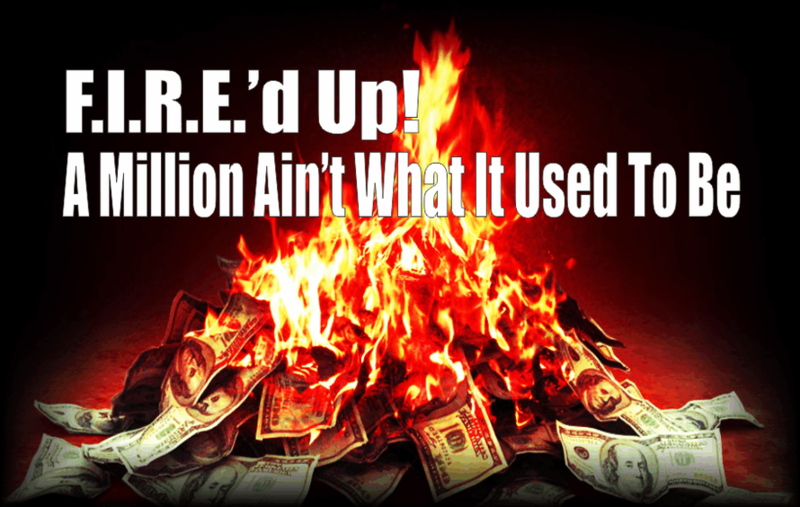 The FIRE (Financial Independence Retire Early) Movement is literally on “fire” after Suze Orman recently suggested that one would need $5 million if they wanted to retire early. FIRE supporters immediately leapt to the movement’s defense and criticized Orman’s view. Here is the interesting part – both are right and wrong. The amount of money you need in retirement is based on what you think your income needs will be when you get there and how long you have to reach that goal. In other words, how much money will you need in the future, on an annualized basis, to live the same lifestyle you live today? In other words, you have to adjust for inflation. Suze Orman suggests that number will be a lot larger due to “life,” increased healthcare costs as we get older, etc. She’s right, but $5 million is a number completely out of touch for most Americans and larger than most would actually need. 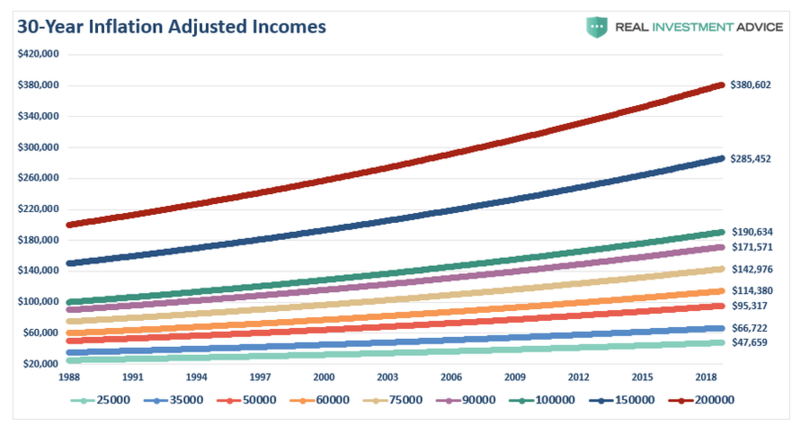 FIRE supporters are right in that you will need 25x your income to fund living costs, but they are also wrong in basing it on current income rather than future inflation-adjusted income. As I said, it’s wrong because it is based on TODAY’S income level and not that of future income requirements. 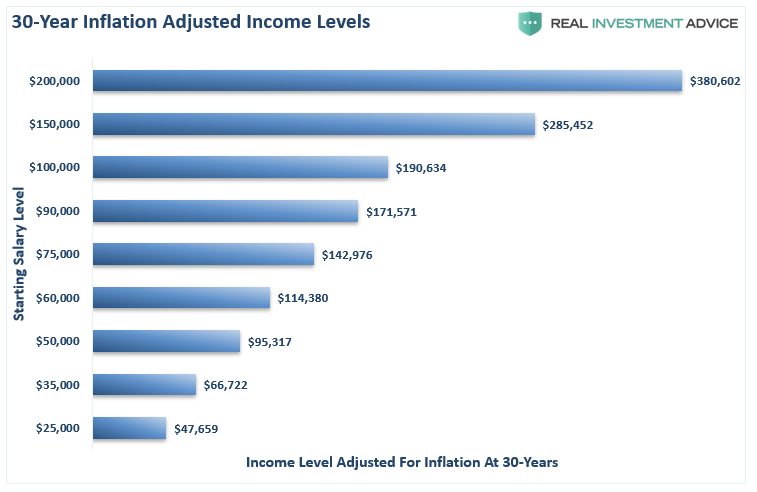 Look at the chart below and select your current level of income. The number on the left is your income level today and the number on the right is the amount of income you will need in 30-years to live the same lifestyle you are living today. This is based on the average inflation rate over the last two decades of 2.1%. However, if inflation runs hotter in the future, these numbers become materially larger. Here is the same chart lined out. The shortfall between the levels of 25x of current income and what is actually required at 4% to generate the income level needed. 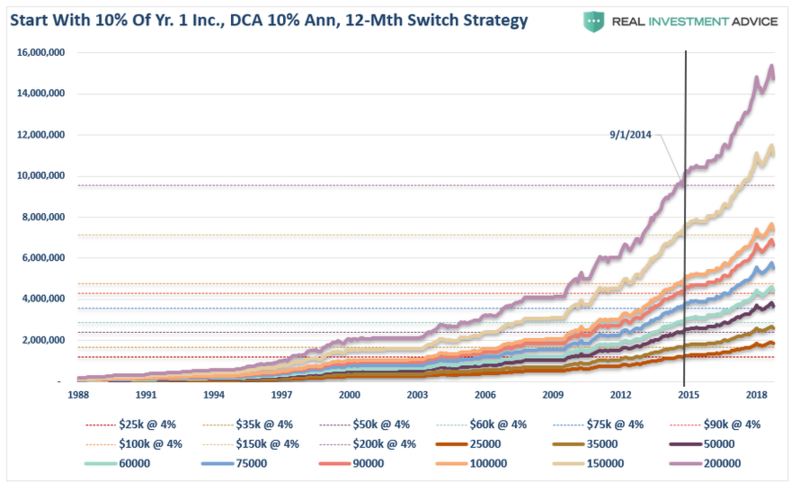 The chart below takes the inflation-adjusted level of income for each brackets and calculates the asset level necessary to generate that income assuming a 4% withdrawal rate. This is compared to the FIRE recommendation of 25x current income. Suze was right. If you need to fund a lifestyle of $100,000 or more today. You are going to need $5 million at retirement in 30-years. For the FIRE followers, not adjusted for inflation is going to leave you short. A new study notes the U.S. retirement savings shortfall is worse than even we previously discussed. 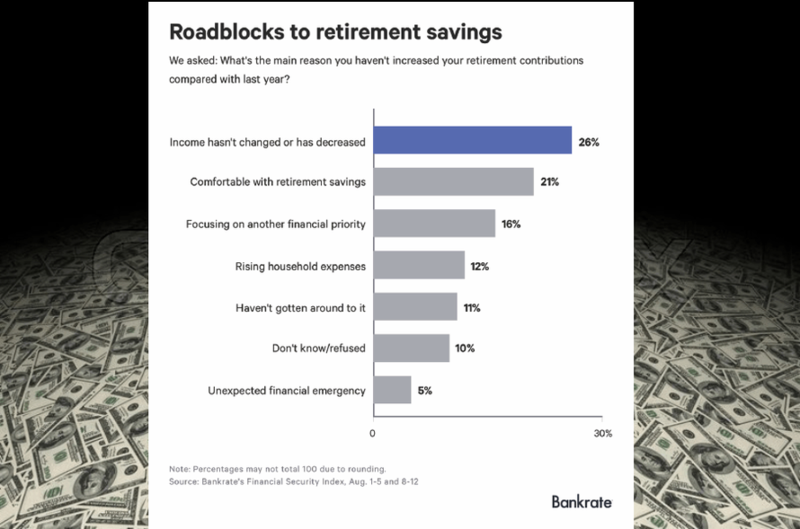 The study by the National Institute on Retirement Security, using data from the U.S. Federal Reserve, shows that retirement savings “are dangerously low” and that the U.S. retirement savings deficit is between $6.8 and $14 trillion. Worse, the median retirement account balance is $3,000 for all working-age households and $12,000 for near-retirement households, the study reports. Account ownership rates are closely correlated with income and wealth. More than 100 million working-age individuals (57 percent) do not own any retirement account assets, whether in an employer-sponsored 401(k)-type plan or an IRA nor are they covered by defined benefit (DB) pensions. 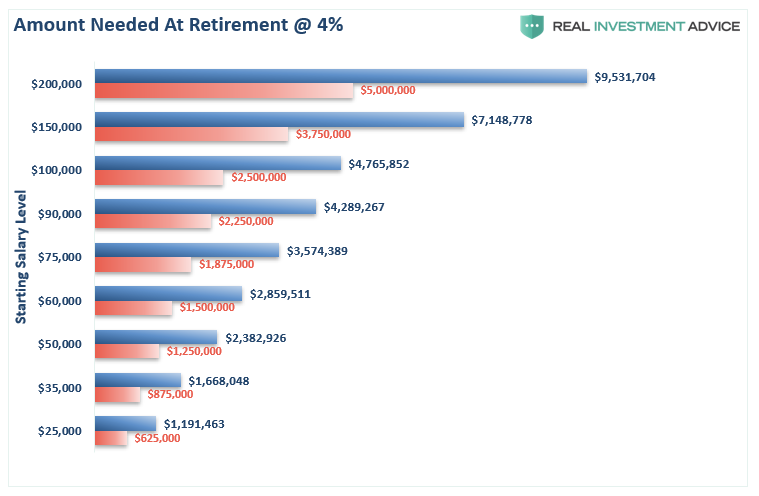 The typical working-age American has no retirement savings. When all working individuals are included—not just individuals with retirement accounts—the median retirement account balance is $0 among all working individuals. Even among workers who have accumulated savings in retirement accounts, the typical worker had a modest account balance of $40,000. Three-fourths (77 percent) of Americans fall short of conservative retirement savings targets for their age and income based on working until age 67 even after counting an individual’s entire net worth—a generous measure of retirement savings. So, FIRE should solve that problem right. Just save 50% of your income and you are good to go. “Why do so many Americans face a retirement crisis today after a decade of surging stock market returns? A survey from Bankrate.com touched on the issue. In other words, the “inability” to save is a huge issue for the FIRE movement. The other problem for the FIRE movement is current valuations. With the markets currently at the second highest level of valuations in history, returns going forward are likely not going to work out as planned. However, let’s give FIRE the benefit of the doubt and assume that someone started the program in 1988 at the beginning of one of the greatest bull market booms in history. They also got one to end with one as well. Since our young saver has to have a job from which to earn income to save and invest, we assume he begins his journey at the age of 25. 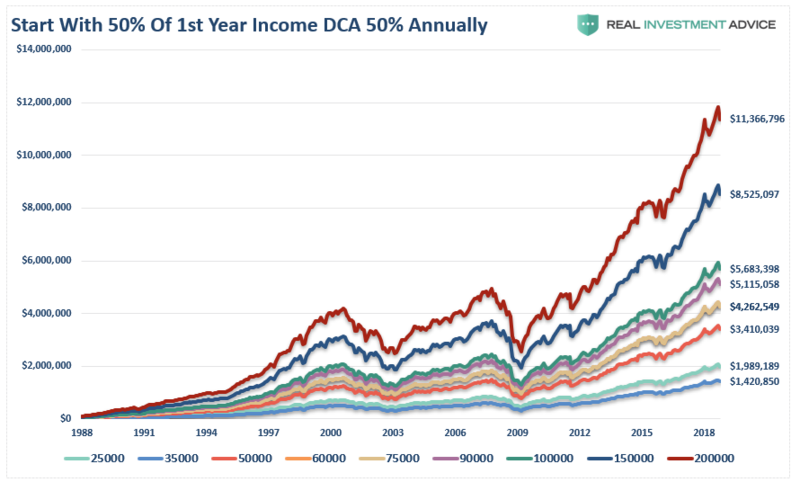 The chart below starts with an initial investment of 50% of the various income levels shown above with 50% annual savings into the S&P 500 index. The entire portfolio is on a total return basis and adjusted for inflation. As shown, the FIRE program certainly works. You just didn’t actually retire all that early. Despite the idea that by saving 50% of one’s income and dollar-cost averaging into index funds, it still took until April of 2017 to reach the retirement goal. Yes, our your saver did retire early at the age of 54, and it only took 29-years of saving and investing 50% of their salary to get there. But given the realities of simply maintaining a rising standard of living, the ability for many to save 50% of their income is simply unrealistic. Instead, the next chart shows the same data but starting with 10% of our young saver’s income and adding 10% annually. There are two important things to note in the chart above. The first is that saving 10% annually leaves individuals far short of their retirement needs. 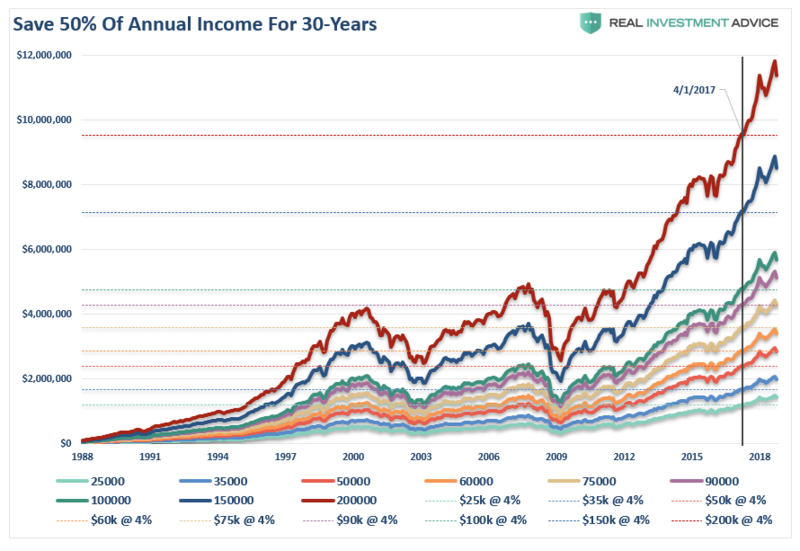 The second is that despite two massive bull market advances, it was the lost 20-year period from 1997 to 2009 which left individuals far short of their retirement goals. It should be relatively obvious the last decade of a massive, liquidity driven advance will eventually suffer much the same fate as every other massive bull market advance in history. This isn’t a message of “doom,” but rather the simple reality that every bull market advance must be followed by a reversion to remove the excesses built up during the previous cycle. 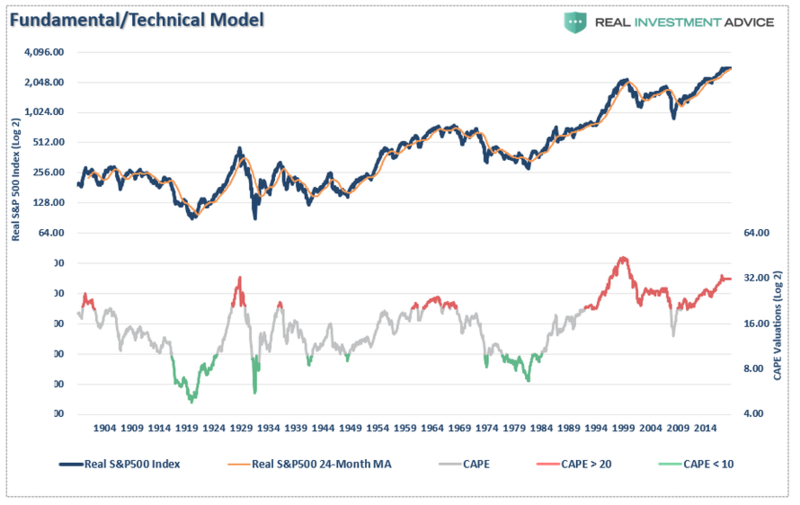 The problem with fundamental measures, as shown with CAPE, is that they can remain elevated for years before a correction, or a “mean reverting” event, occurs. It is these long periods where valuation indicators “appear” to be wrong where investors dismiss them and chase market returns instead. There are many ways to approach managing portfolio risk and avoiding more major “mean reverting” events. While we don’t recommend or suggest that you try to “time the market” by being “all in” or “all out,” it is critical to avoid major market losses during the accumulation phase. The example below uses a simple 12-month moving average to explain the importance of avoiding major drawdowns. 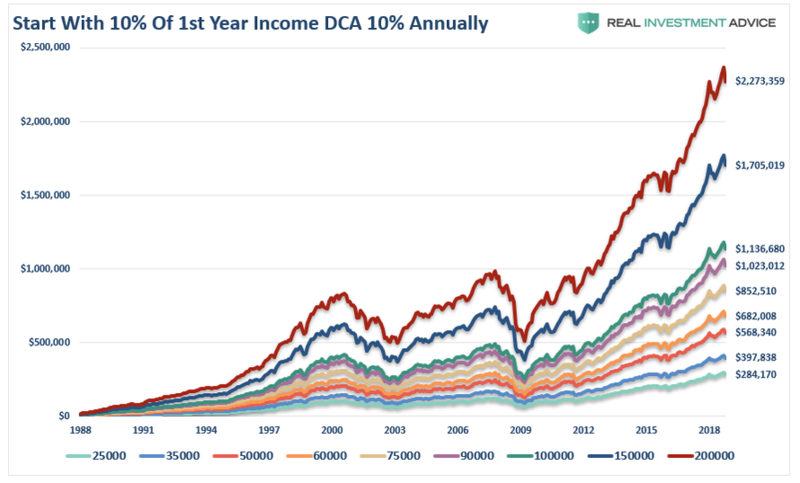 It is the same 10% savings rate as above, dollar cost averaging into an S&P 500 index on a monthly basis, and moving to cash when the 12-month moving average is breached. By avoiding the drawdowns, our young saver not only succeeded in reaching their goals but did so 31-months sooner than our example of saving 50% annually. Don’t misunderstand me….I love the FIRE program. I love ANY program that encourages individuals to get out of debt, save money, and invest. In 1980, a million dollars would fund a healthy retirement. That isn’t the case any longer as rising inflation eats away at the purchasing power of individuals.